The aim of this page is to share some eBay help and search tips for those looking to buy replacement china. If you are seasoned eBayer, you likely already know this stuff, but hopefully it will be of help to some. 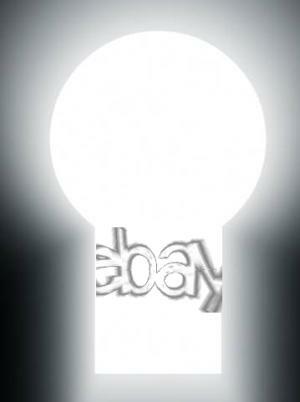 When looking on ebay, the keyword terms you put into eBay's search box will define whether or not you find your item. In 2007, we ran a test. The eBay search box proved a poor aid. 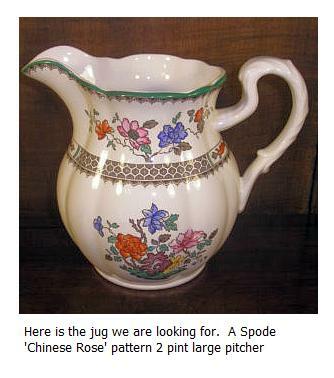 We were trying to locate a Spode 'Chinese Rose Pattern' Large 2 pint jug. We failed. The jug was there, just hidden. We found out, almost by accident, that the jug was being sold on eBay at the time we were searching, but it was hidden by the inept search facility. So, in the meantime, eBay have spent some of their huge profits on better programmers, and the system is supposed to have improved. We have run the same test in November 2013. In our china replacements website review page, we use, as an example, a Spode Jug (large size) in the 'Chinese Rose' pattern. We use the same example in both our 2007 and 2013 tests. Why? It is a hard, but not impossible, item to find, and therefore a good subject to use as a talking point for search techniques. Our item is is called two different things. Sometimes they are referred to as 'pitchers' (more commonly in the US). And sometimes called 'jugs' (more common in the UK). 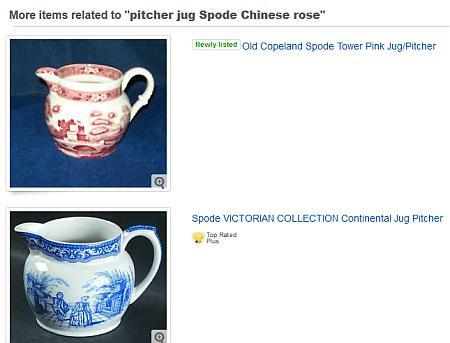 "pitcher jug Spode Chinese rose"
"0 results found for pitcher jug Spode Chinese rose "
Immediately beneath this zero result is a list of alternative items. On the US eBay, nothing on this list of alternatives is even close to the desired object. 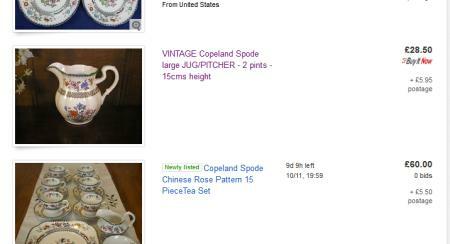 On the UK eBay, our large 2 pint jug is 6th on the list. Well done UK eBay (but surely it should have been higher than 6th as most of the keywords matched). The UK seller states wordwide postage, so no reason not to be listed on US eBay. Bad luck if you live in the US and and want this jug. Many people would give up at this point and assume the jug/pitcher is not available on eBay. How do you find this listing if you are in the US? Either change your keyword search and do several versions. 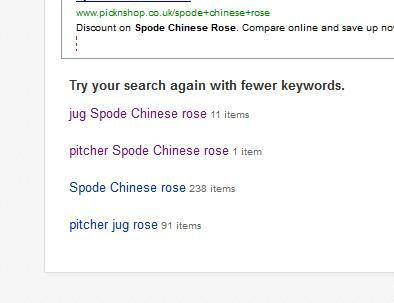 "Large pitcher jug Spode Chinese rose"
Do your best attempt at a relevant keyword search. 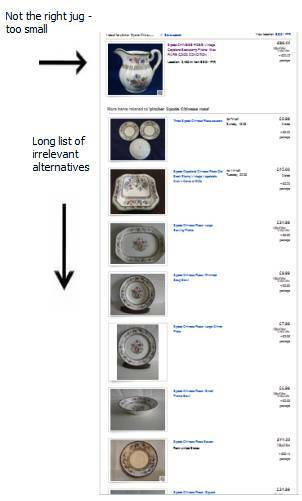 Then, check with eBay what it suggests as good alternative searches. Where do do you find this vital information? Scroll down to the hidden depths of the page (at the very bottom below the ads) and you will find this list of alternative search phrases. The obvious link to click is the top one - 11 items listed under 'Jug'. The jug we want is NOT there. There are some smaller version of the jug, but not the large pitcher. So we click on the second link with only one result. Is this the illusive large pitcher? Then, eBay give again another list of alternatives. THE JUG WE WERE LOOKING FOR! This is the large 2 pint jug we wanted along. It is only £28.50. The seller has used the words we put into our original search in his headline description. We said:- "pitcher jug Spode Chinese rose"
The seller said:- "jug pitcher Spode"
The seller omitted the pattern name, and added the words 'vintage' and 'Copeland'. .... not specifying the pattern (as the seller had not specified the pattern in the title), then we would have found the jug quicker. There were 6 local US listings for this search term. Under that there were 3 international listings, where our illusive jug was showing. Once you have worked out what search terms are useful for finding your item, you can get eBay to email you every time a new listing is put on. Just click the "save this search" button and ebay help will let you know whenever goods come online. IMPORTANT FOOTNOTE! 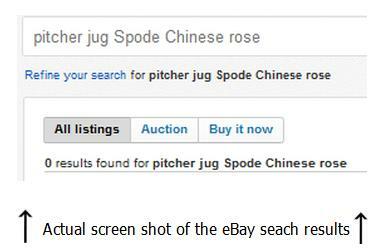 Please don't spoil all this clever ebay help searching by missing your item for a bid. In other words, please decide your maximum bid and put that bid on the automatic bidding system. Auto ebay help will automatically outbid your rival by a small figure each time until your max is reached. All you have to do is go to the "Your maximum bid: Place Bid" link underneath the starting price and then input the most you would be prepared to pay into the box shown below. Ebay help will NOT immediately put that full amount into the auction, it will put only just enough in to beat your rival's last bid! All done automatically for you. Neat! The moral of this story is, if eBay's search tells you there is zero results, do not believe them. Assume the eBay search programmers don't know what they are doing. Be very creative with your keyword phrases, try lots of alternatives, look at eBay's alternative search suggestions (usually at the very bottom of the page below the ads). Then, once you have worked out the right words to use, save the search. When bidding, use the auto-bid feature. Don't lose your item for a bid.